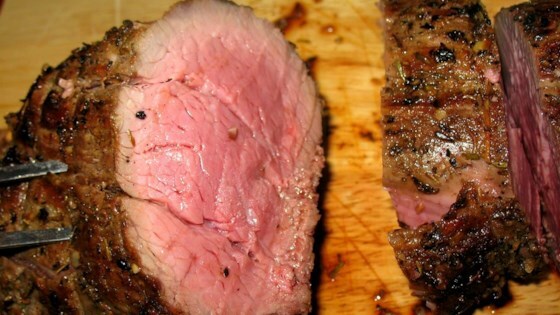 Prepare beef: Trim off excess fat with a sharp knife. Fold thin tip end under to approximate the thickness of the rest of the roast. Tie with butcher's twine, then keep tying the roast with twine every 11/2 to 2 inches (to help the roast keep its shape). Snip silverskin with scissors to keep roast from bowing during cooking. Then, mix oil, garlic, rosemary, thyme, pepper and salt; rub over roast to coat. Set meat aside. Move meat to the charcoal grill's cool side, or turn off burner directly underneath the meat and turn remaining one or two burners (depending on grill style) to medium. Cook until a meat thermometer inserted in the thickest section registers 130 degrees for rosy pink, 45 to 60 minutes, depending on tenderloin size and grill. Let meat rest 15 minutes before carving. This was ok, we made it with steaks instead of a roast...I am not sure if the cut really makes the difference. My daughter liked it though and she is a picky eater. great recipe BUT watch the servings. I had 6 hungry adults, served taters and vegetables and was barely enough. I would go 8 max. Made this with filets instead of a whole beef tenderloin. This was lovely and I have been thinking about it all week. In fact, I made it again for friends a couple of nights ago. I made this using 2 lbs of filet mignon steaks and halving the rub. It was cold and rainy outside, so I broiled my steaks until medium doneness. They were delicious!